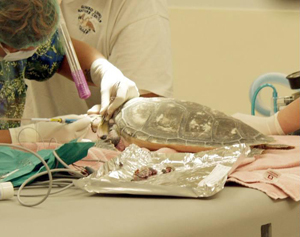 Palm Beach Zoo and Gumbo Limbo Nature Center performed laser surgery on several endangered green sea turtles to remove fibropapilloma tumors on the turtles’ eyes and flippers. Fibropapillomatosis (FP) is likely caused by a virus. The tumors are not cancerous but impair the vision and mobility of the sea turtles and the tumors may become infected creating secondary health risks. In Florida, the disease has reached epidemic proportions. Although it is not thought to be directly caused by pollution, poor water quality in Florida’s inner waterways is likely to be a driving factor for the disease outbreak. The only treatment for the disease is to remove them with a laser. Multiple factors including stress from pollution, changes in sea turtles’ diet due to a strained environment, and compromised immune systems may all play a part in green sea turtles susceptibility to the disease. Gumbo Limbo Nature Center is only one of four sea turtle rehabilitation facilities in Florida that treats turtles with FP. 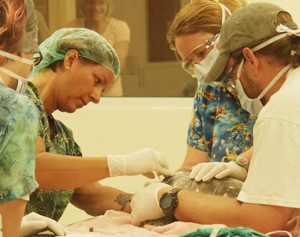 Gumbo Limbo Nature Center formed a partnership with The Palm Beach Zoo’s Center for Conservation Medicine at the Melvin J. and Claire Levine Animal Complex when it opened its Sea Turtle Rehabilitation Facility in January of 2010. The partnership was made to share resources and advance the emerging field of conservation medicine. The state-of-the-art laser being used by Gumbo Limbo’s veterinarian, Dr. Nancy Mettee, was recently donated to Friends of Gumbo Limbo by The National Save the Sea Turtle Foundation through a gift in memory of Suzanne Kemp to support the partnership between Gumbo Limbo and the Zoo. The laser is not only precise but powerful enough to operate on much larger animals. Friends of Gumbo Limbo Development Officer, Mike Zewe said, “The Palm Beach Zoo and The National Save the Sea Turtle Foundation have been critical partners in making our Sea Turtle Rehabilitation Facility a great success. 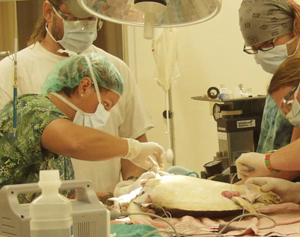 The Zoo offers a place to perform surgeries and provides additional equipment such as an x-ray machine, while The National Save the Sea Turtle Foundation continues to financially back the program. To date, we have already treated more than 200 endangered sea turtles and have had more than 100,000 visitors to the Center since its opening.